Free Nights Offer – Qualifying stays at OZEN can get up to 5 nights free. Please contact us for further details. Terms & Conditions apply, and subject to availability. Take the opportunity to stay in one of the Maldives’ newest resorts, Ozen by Atmosphere at Madhoo in South Male Atoll. Opening July 2016, there’s a fantastic buzz surrounding resort, which will have luxuriously private stand-alone villas, an indulgent all-inclusive meal plan and a PADI-certified dive centre. A first look at the resort shows fabulous overwater villas with viewing platforms over the reef, high ceilings and bright décor, as well as private pools and direct access to the ocean from expansive decks. The villas are built on the three elements of earth, wind and water, with features to reflect this. Earth Villas celebrate beachfront living with large outdoor decks and tropical gardens, and outdoor showers bringing the outside in. Wind Villas are built over the water with uninterrupted views of the lagoon, with vibrant colours and a romantic feel – they’ll be perfect for honeymoons and you can upgrade to one with a pool if you’re yearning for the ultimate Maldivian experience. The OZEN water suites are enormous, with a stunning 35 square metre pool, personal gym, kitchenette and dining pavilion for dinner alfresco. Early Booking Offer – Enjoy up to 10% discount for applicable bookings made at least 30 days in advance. What better way to slip into marital bliss than with a stay at one of the Maldives’ newest resorts? 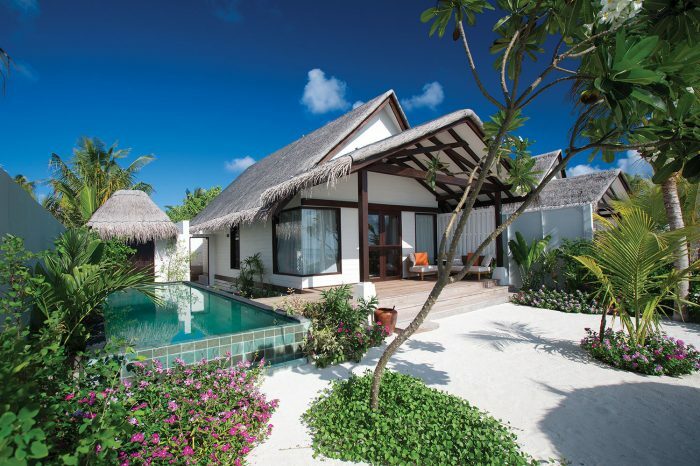 You could enjoy a honeymoon in bliss at OZEN by Atmosphere at Madhoo, the Maldives. Be the first to book one of the stylish and very private villas and take advantage of the immaculate facilities and array of activities to participate in. With an array of striking restaurants offering cuisine from around the globe, a fantastic choice of watersports and an expansive spa, this is one resort you’ll want to keep an eye on when booking your honeymoon in paradise.